Personally, I couldn’t live without my duvet. There’s nothing it can’t fix – if I’m tired, grumpy, cold, ill, watching a film or drinking a cup of tea, it’s always far better in my duvet. Okay, I may have selected duvet-appropriate examples there but you catch my drift. My duvet is a cloud, a puff of cosy brilliance that engulfs me and floats me off to the land of nod in no time – getting sleepy just thinking about it! The importance of your sleeping tools is parallel with the importance of sleep itself, show me someone that isn’t seeking The Perfect Night Sleep and I will show you a fibber! Everyone wishes to wake up after a blissful slumber feeling well rested, reinvigorated and ready for the new day, waking up tired just isn’t a viable option. Not only is sleep vital for efficient cognitive function, it also dictates your mood, aids physical and emotional well-being, boosts metabolism and keeps you alert – all fundamental contributing factors to a happy, healthy and safe lifestyle, and all reasons to start perfecting your sleeping scenarios. My night’s sleep improved tenfold when I actually took the time to find a duvet that suited me. Until you look into it you don’t think there can be that much difference between one duvet and another or that it can significantly have an impact on your quality of sleep – but trust me, there is and it does. So how do you know which duvet is going to be your cloud? The Fine Bedding Company have been established for over forty years and there is nothing they don’t know about sleep, their range of duvets, pillows and protectors incorporate top of the range sleep technology to provide exceptional bedding to aid you in your quest for The Perfect Night Sleep. The Fine Bedding Company has been transforming the world of sleep with innovative, quality designs, using their expert knowledge to leave you in love with sleep. Firstly you need to establish whether you would rather a synthetic or a natural filling. Synthetic is your better option if you suffer from allergies- obviously predominately to feathers or down. You are also going to find machine washable duvets in the synthetic range; in particular some duvets can be washed at 60°, which is the temperature that kills dust mites. Synthetic duvets often offer better warmth to weight ratio, meaning they are lighter for the same warmth, but you may like the heavy feeling of a warm duvet on you, in which case a natural duvet is for you. If you find you get too hot in the night, you might be better off with a lighter weight microfibre duvet, but you can sometimes loose breathability which helps with keeping cool; natural duvets are more breathable as natural fibres always allow your body to breathe more effectively. If you just thought, ‘too hot in the night, are you mad?’, hello fellow never-too-hot-for-a-duvet friend! In my logical opinion, a duvet can never be too thick or fluffy, yes I may get a tad hot on the eight days of the year it actually rises above 20 degrees, but I can live with that. Other than these points it generally comes down to preference and budget. The natural feather or down filled duvets tend to be your more premium options and so cost a little more, but spending more does not necessarily mean you’re going to get the best duvet for you, some people just can’t get on with feather filled duvets or prefer the look and feel of synthetic. At entry level we have the Duck Feather and Down Duvet, this is your exceptionally good value for money natural duvet, offering duck feather and down encased in 100% Cotton cover, which is also down-proof (so the feathers shouldn’t escape). 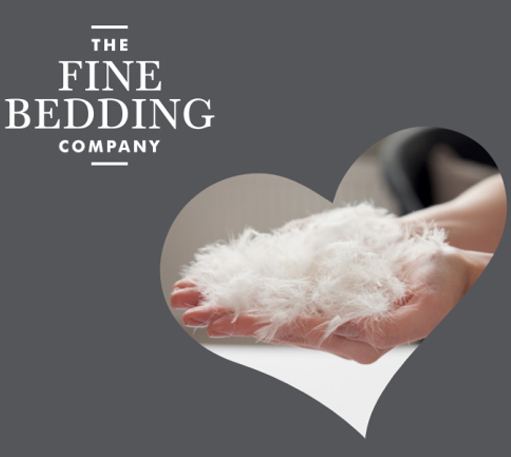 Your next option for a natural duvet is the Goose Feather and Down Duvet, a slightly higher filling than above so it’s that little bit warmer. This is good if you want a duvet with a bit more weight, for that cosy ‘tucked-in’ feeling. The Goose Down Duvet, your ‘better’ option, has a higher ratio of down to feather than the previously mentioned duvets, 60% Down, 40% Feather. It’s naturally light and breathable yet supremely warm, perfect for those of you who get very chilly in the night. Fine Bedding Company’s crème de le crème of natural duvets is the Platinum European Goose Down, for the finest night sleep you will ever have. The Platinum European is the ultimate in luxury, the lightest, most breathable duvet they offer with the highest natural fill… pure indulgence! Your most reasonably priced synthetic duvet is the Soft Embrace, with a cotton blend cover and 100% polyester filling, the Soft Embrace offers a little bit of affordable everyday luxury. It’s a quality, yet standard duvet that is perfect if you want a cosy duvet but you’re on a budget. Next is the legendary Spundown Duvet. The Spundown is our bestselling duvet; the compressible filling enables it to fit into a domestic washing machine. Better still, it’s non-allergenic and can be washed at 60° so you can kill those pesky dust mites, which is especially good if you suffer from allergies or asthma/eczema. The Spundown can be washed over and over, but never looses the original quality or shape. It also has a peach-soft cover which adds unbelievable comfort. Do you tend to wake up either shivering or sweltering during the night? There’s nothing worse than waking up mid dream because you’re freezing or getting tangled in the duvet because you are haunted by heat. Actually, it’s worse if you share a bed and your partner is a human radiator and you’re a glacier ice berg! Well, The Fine Bedding Company are to your rescue, for some time they have been refining a temperature regulating duvet, a magical wander that will synchronise your body temperature to its optimum during sleep by using Lysoft® technology: The Breathe Duvet. The finest synthetic duvet The Fine Bedding Company offer is the Boutique Silk. This is for you if you want a luxurious hotel experience, the added opulence of silk offers unparalleled comfort. If you find it hard to get out of bed now, wait until you try to leave this beauty! A critique of some synthetic duvets opposed to natural is the way the duvet hangs or drapes, often natural duvets drape more naturally over your bed, but the Boutique Silk drapes absolutely beautifully on the bed and you. The non-allergenic composition is incredibly light yet incredibly warm and can be washed at home. Now, Just to find the right pillow…. bedding, Boutique Silk, choose a duvet, choosing the right duvet, duck feather and down duvet, Fine Bedding, goose down duvet, goose feather and down, Machine Washable Duvet, Platinum European Goose Down, right duvet, right duvet for me, Soft Embrace, Spundown, The Fine Bedding Company. Bookmark.